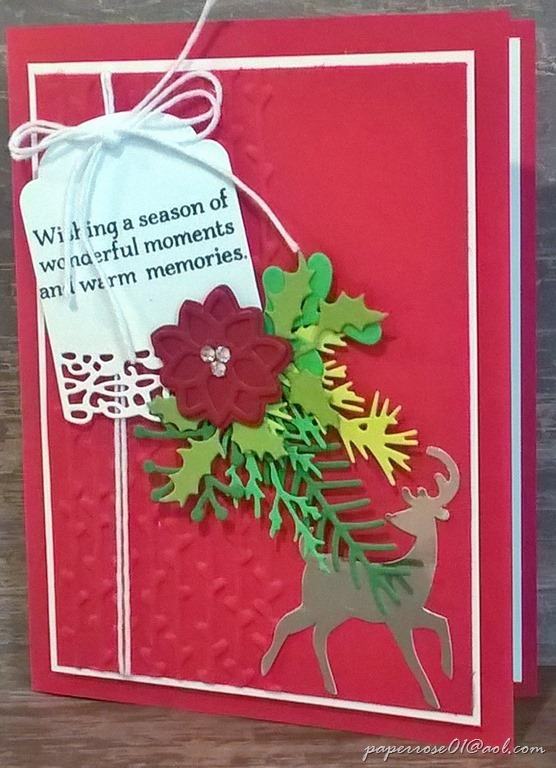 A bit of forest with a gold reindeer and a small poinsettia – perfect for Christmas. The top layer of our red and green card has been embossed with the linear folder of the Petal Pair embossing folder set. White Baker’s twine wraps around the card and a simple shoestring bow is tied around the twine and thru the sentiment. The die for the sentiment comes from the Sweet Cake framelits. The assorted forest branches are die cut in shades of green using the Pretty Pines Thinlits and a set of Tim Holtz dies I acquired several years ago. 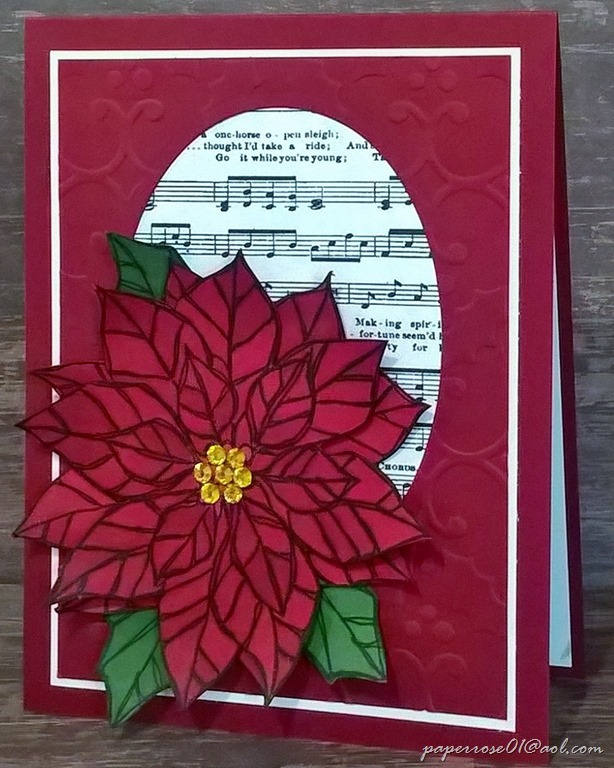 The connecting point of the branches is hidden with a small Cherry Cobbler poinsettia cut from a retired Embellished Ornaments die. 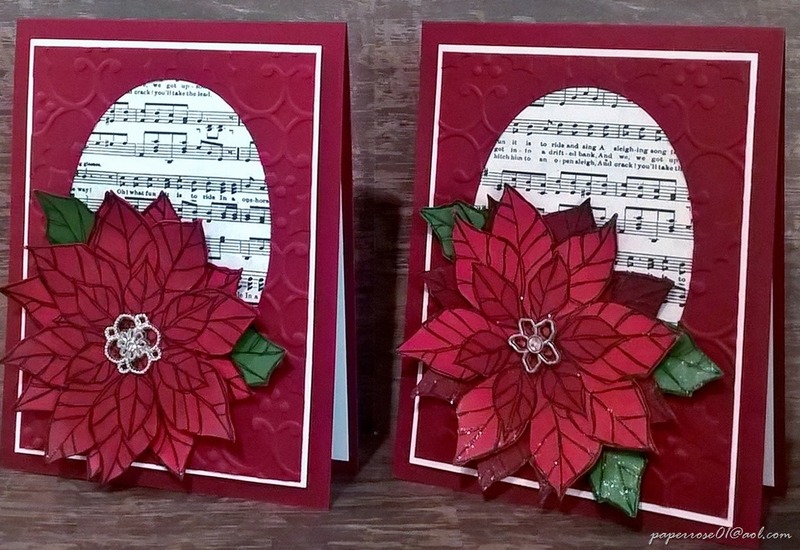 The blossoms on the poinsettia are punched in gold glimmer paper but could also be done with colored rhinestones. Finally, tucked under the forest branches, we see a simple gold reindeer. The silver version of this card features rhinestones and a silver reindeer. This card can also be done with additional forest branches and no reindeer. 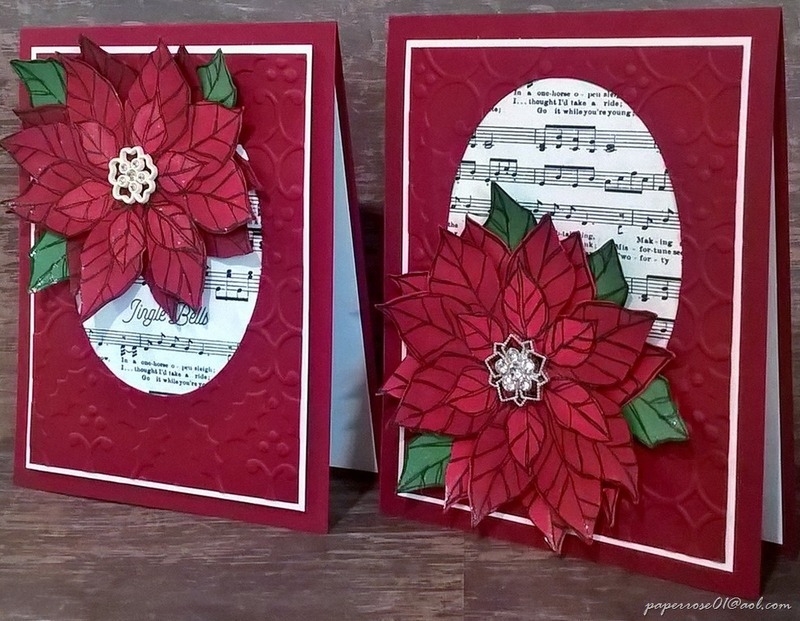 Wink of Stella is used on the poinsettia and can be used on all or some of the forest branches. I hope to hear from you regarding your availability to attend the Christmas in July Stamp-a-Stack. I am truly pleased that my sweet husband and daughter pushed me to make this happen. Remember, monthly stamp camp starts in August – August 2, 3 and 4. We will be featuring the end of summer. Yes Virginia, there is a Santa Claus and there will be Christmas in July for the Paperrose01 Crafters! I know I expressed my hesitation about pulling together this large Christmas project but with the prodding of my sweet husband and daughter, it will happen! 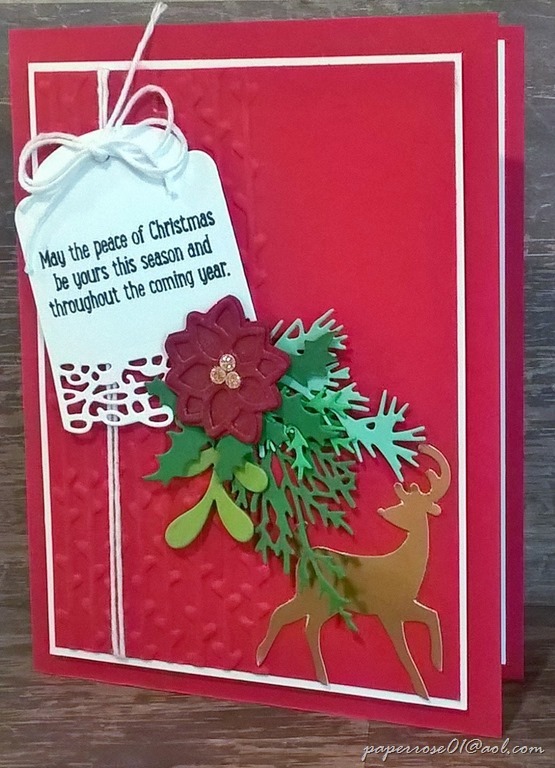 As the Stampin’Up Occasions Catalogue with all the new Christmas stamps does not come out until later this summer, I have raided my retired file! It has been several years since we’ve seen Greeting Card Kids. I decided we would use this darling stamp for our Christmas in July. Her coat is trimmed in Cherry Cobbler and sparkles with Wink of Stella. 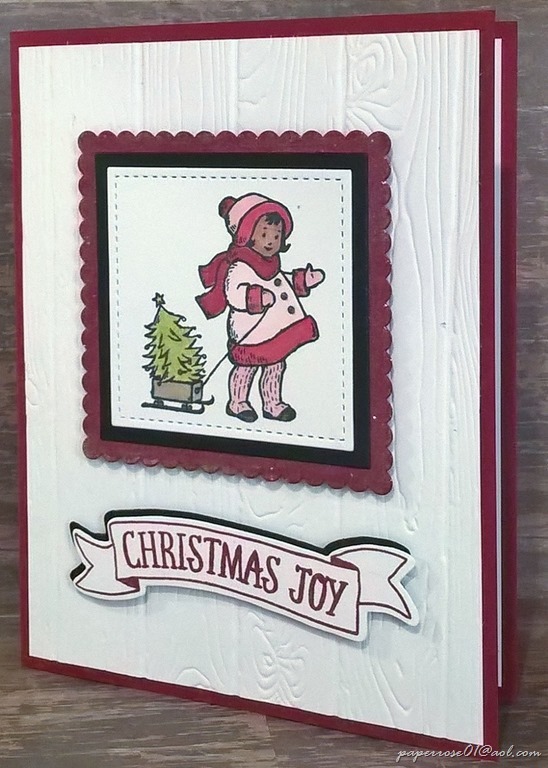 Several shades of the Stampin’ Blends can be used to color the wagon and the tree sparkles in Old Olive. Our little gal is stamped on a stitched square and framed in black with a Cherry Cobbler scallop square. 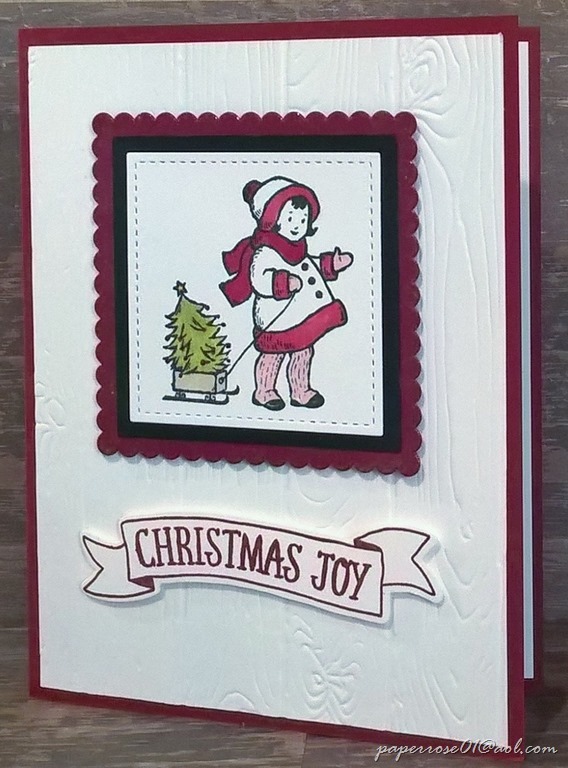 The card background is whisper white embossed with the wonderful 3D Dynamic Pinewood Planks embossing folder. 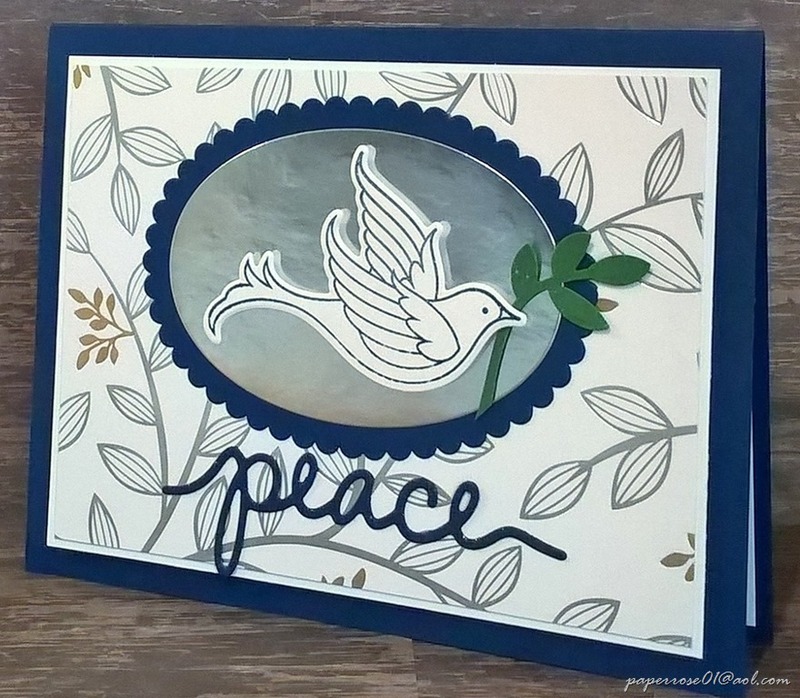 The Stampin’ Blends are perfect for coloring images such as Greeting Card Kids. The bronze marker easily changes skin color as does the ivory. My samples are very similar but I varied the light and dark Cherry Cobbler blends as well as what glittered with Wink of Stella. The Christmas Joy (retired) sentiment is shadowed in black in this image. You, of course, can choose your own colors. The only constant is the card stock which will be pre-cut for you. So…you may be asking when Christmas in July will take place and how much will it cost? Christmas in July will take place on July 19 from 11 am to 7 pm – and on July 21 from 9 am to 4 pm. The cost will depend on how many cards you choose to do. The cost will include your very own new Wink of Stella for you to take home. Of course all your adhesive, embellishments and other supplies and tools are provided. We will be using a lot of Wink of Stella. Check back tomorrow for another of the 4 cards. I am prepping as much in advance as I can. 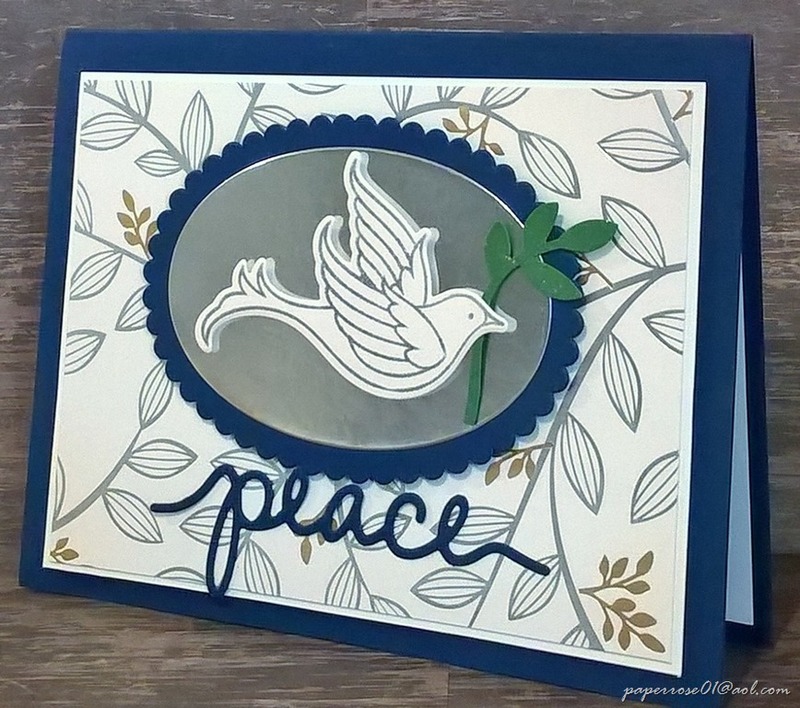 In fact, all the branches for the Dove of Peace card are done! I would appreciate a firm commitment if you plan on coming as I don’t want to over prepare. We have out of town company coming for a week in early July, so I have to complete as much as I can now. It would be very helpful if you can let me know which day you might come and how many cards you choose to do. I will not be able to provide any kits for Christmas in July. However, if your time frame does not work, I will work with you to come up with a time that works for you to complete your cards.